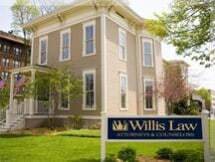 Regardless of the legal issue affecting your life, your business, your family and your future, you can find the quality, effective representation and support you deserve at Willis Law in Kalamazoo, Michigan. Unlike other legal practices, our law firm offers fixed price legal services so that you will know what to expect upfront and you won’t have to worry about surprise legal fees showing up on your bill. As further evidence of our commitment to you, we promise to stand side by side with you throughout all legal proceedings to protect your rights and interests while fighting to help you achieve the favorable outcomes you expect no matter how complex your situation. From this mission to deliver the highest level of advocacy and support to those we serve, our attorneys have earned numerous awards and honors, and we strive to develop long-lasting, beneficial relationships with our clients so that we will be your first choice for years to come. To find out more about how Willis Law can best serve your needs while helping you secure a brighter future for yourself, your family and your company, you can reach out to us by calling our law office or visiting our website to schedule a free initial consultation.